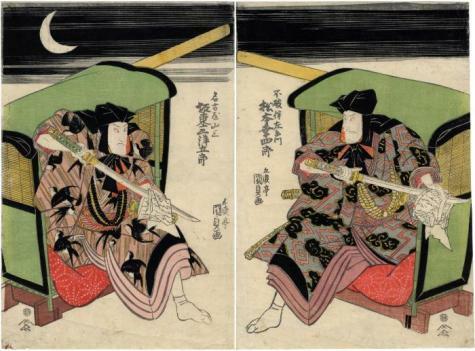 There is a novel from 1807 by Santō Kyōden, Mukashi banashi inazuma hyoshi (An Old Time Lightning Bolt Tale) in which the two major antagonists wear kimonos which identify them iconographically. Fuwa Banzaemon carries a sword called 'Thunder' and wears robes with a lightning and cloud motif. His opponent Nagoya Sanzaburō's sword is the 'Amorous Swallows' and his robe is decorated with the 'swallows-in-the-rain' motif.